Olive Garden Five Cheese Ziti al Forno copycat recipe made with marinara, alfredo, mozzarella, fontina, romano and parmesan cheese baked together with a crispy panko topping. 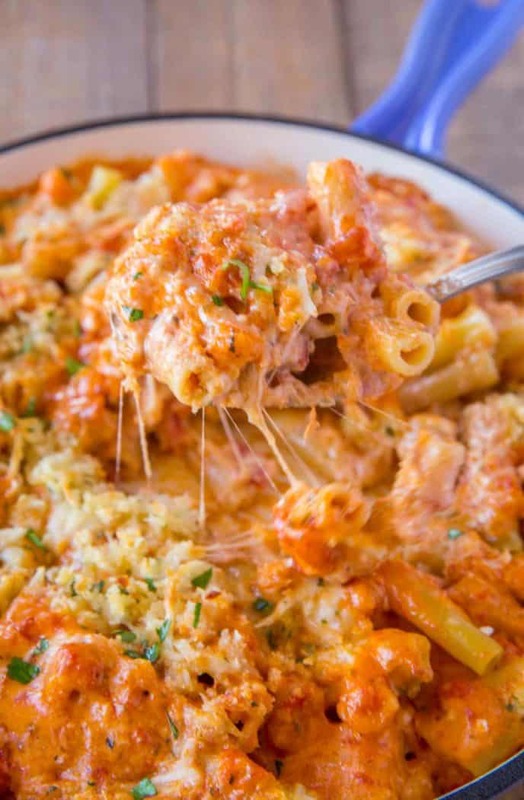 This baked ziti recipe is a huge hit with crowds and potlucks just like my super popular Baked Million Dollar Spaghetti and Ultimate Meat Lasagna. This Ziti al Forno is like the best baked ziti recipe you’ve ever had kicked up about ten more notches. A mixture of marinara and alfredo sauce along with five (yes, I mean five) additional cheeses maked this dish an over the top extravagant recipe you won’t have to wait for a trip to Olive Garden to enjoy. 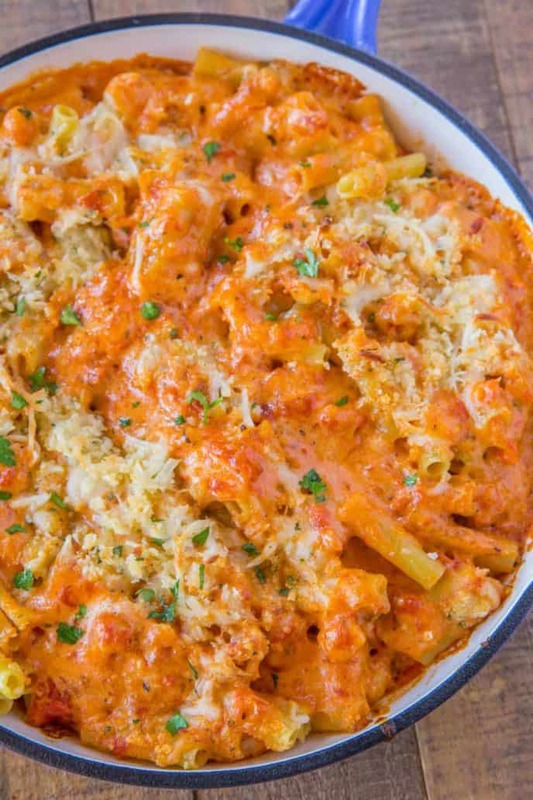 This baked ziti is different than the traditional baked ziti which is made with marinara sauce, mozzarella and ricotta cheese. With a mix of two sauces and five cheeses you’d think that all the flavors would be muddled, but they work so well together that you’ll find yourself routinely mixing marinara sauce and alfredo sauce even when making a simple spaghetti dinner. Can you make this ziti al forno lasagna? YES and I love the way you think. We had a girls night in recently and experimented with this recipe as lasagna. Let me tell you, it was probably the best lasagna I’ve EVER eaten. We did add ground beef to the recipe because it needed more substance than just cheese. We also definitely added the crispy topping. This Olive Garden recipe is vegetarian but you can absolutely add meat or seafood to the dish. Adding shrimp is a fantastic option, sliced and seared chicken would be great too. Can you freeze/reheat Ziti al Forno? Looking for more Copycat pasta recipes? Let me know if you have any copycat recipe requests. I have a lot more coming, some from Olive Garden in fact! If you have a recipe you’d like to see let me know in the comments below. 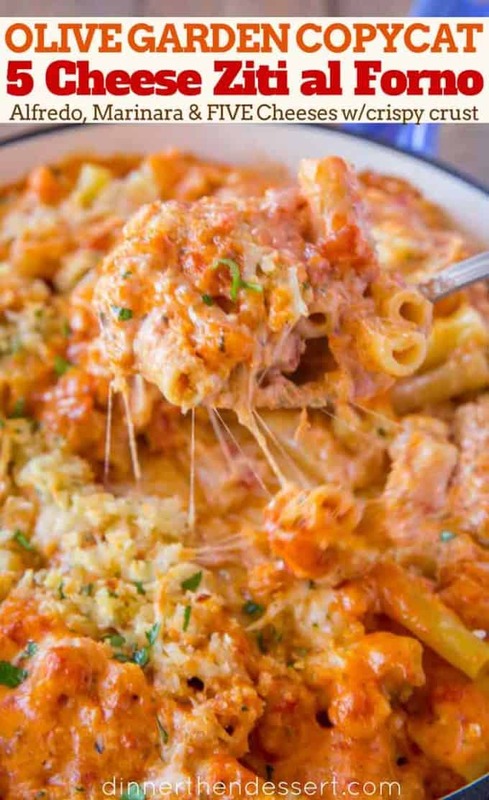 Olive Garden Five Cheese Ziti al Forno copycat recipe made with marinara, alfredo, mozzarella, fontina, romano and parmesan cheese baked together with a cripy panko topping. Cook the pasta one minute shy of the directions on the box and drain. 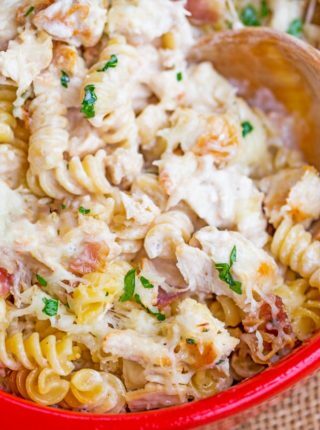 In a large metal bowl add the pasta, marinara sauce, alfredo sauce, ricotta cheese and fontina cheese and mix well. Add to a large oven safe skillet or 9x13 pan. Mix the mozzarella, panko, romano, parmesan and garlic together and add the topping over the pasta. Bake for 30-35 minutes uncovered until golden brown and bubbly. What is the green stuff sprinkled on top? I notice that ingredient in the recipe posted but I see it in the photo! I just sprinkled a little parsley on top for presentation. Totally optional. I hope you enjoy the dish. What about a copycat recipe for Longhorn Steakhouse’s Steakhouse Mac and Cheese? I currently have a batch of this in the oven and it’s my second time making it! It’s absolutely delicious! Thanks for the 5 star rating, Maddi! So glad you love it so much! Fontina cheese is not readily available to me as I am located in another part of the world. Would this recipe still work without it? I’m not fussed about replicating Olive Garden’s recipe, but instead, I want it to still taste good. Yes, it would work to leave out but you could also substitue with a mild provolone, gruyere or gouda cheese. Enjoy! You have some really great recipes. I see you listed servings and calories but I have the carbs. I am diabetic and I am on a stick diet. I have to know every carb so I can adjust my insulin. Can you please list carbs. I love these recipes! I’m so glad you’re loving the recipes. 🙂 All of the nutritional content comes from a computer plug in not a nutritionalist. I would suggest calculating on your own to be sure it’s completely accurate since it has to be so precise. Hi! I was wondering what brand or recipe you used for the marinara and alfredo sauces. Thanks! I’m not really tied to any brand so use whatever brand you prefer is store bought. Hi! Is there a specific brand (or recipe) of marinara and alfredo you use? Mine didn’t come out quite right and I think it’s because of the sauces I used. Thanks! I just made this for company and everyone absolutely raved about it! I added sautéed mushrooms, zucchini, and tomatoes. Thank you for a fantastic recipe! 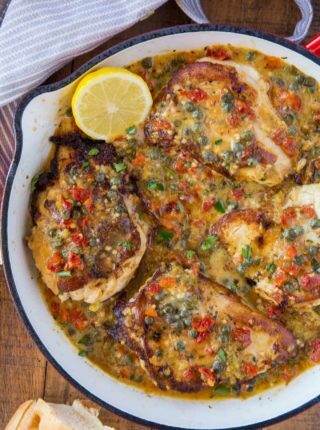 Do you have a recipe for Olive Garden Chicken Scampi? It’s my favorite! It took me a bit to get to, sorry about that! 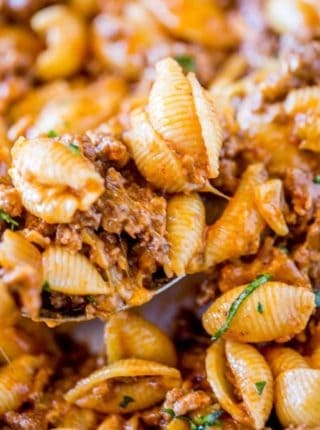 can you use rigatoni pasta instead of ziti pasta? It won’t be authetic to Olive Garden but of course, use whatever pasta you’d like! It’s best with rigatoni at olive garden! I am just here for the sauce ?? I made this recipe for a few of my friends and it was a huge hit!! Everyone went back for seconds and wanted to take some home. I highly recommend this recipe to anyone who loves a good 5 cheese ziti!! 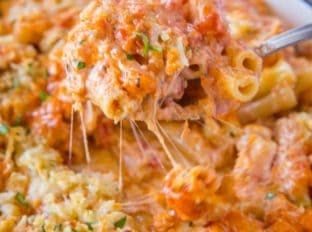 It tastes very similar to the Olive Garden 5 cheese Ziti al Forno!! can you make this recipe the night before and bake it the next day? I would suggest making it all up to step 4 and then right before baking, complete step 5 and bake. Hope this helps! Can you leave out the Alfredo sauce in recipe? No, I’m sorry but that would completely change the recipe and it would no longer be a copycat of Olive Garden. Can you leave out the Alfredo sauce in the sauce? Leaving it out would completely change the recipe and it would no longer be a copycat, sorry. What??? 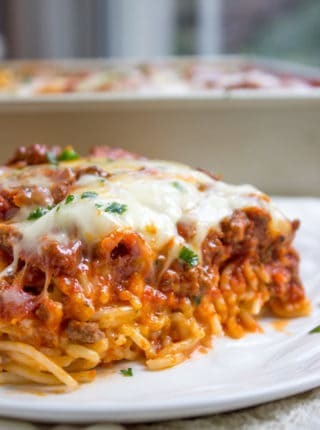 You tease us with reassurances that this drool-worthy dish can be turned into lasagna then give no specifics for added ingredients or changes in directions? Please, please give some details, or even a whole recipe. Thanks so much! Sorry to tease you more but it’s coming soon! Stay tuned!! Yay! In hopeful anticipation, I had added Dinner Then Dessert to my Bloglovin’ feed. I already know that 3 out of the 4 of us will love this, and the to-come lasagna. (My older son doesn’t like cheese! I know, right?) Anyway, have a fantabulous rest of the week. This looks really good! Perfect to try this weekend! I can’t believe how good this looks! Thank you! You’ll have to let me know what you think after trying it! This is SO awesome!! My family would LOVE this!! This is my favorite dish to order from Olive Garden, and I can’t wait to make it at home!! Awesome…no need to go out for it anymore! Love copycat recipes! Saving this one! This is so so cheesy!